UPDATE 11-15-08: ScorpioMaurus was kind enough to fix the mesh so that it no longer flashes blue. She also made a custom thumbnail for it in Body Shop, which is pretty cool. You can download the FIXED files below. 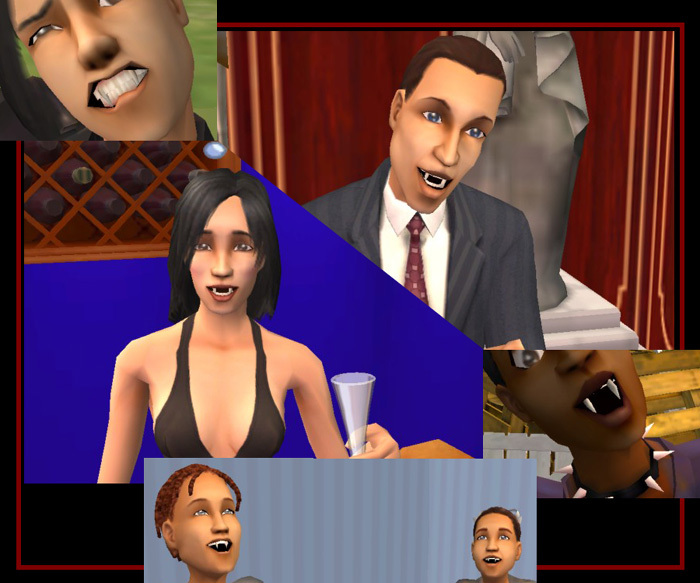 Here are vampire teeth as an accessory, so any sims can bare their fangs with pride. These are based on the Maxis vampire teeth, modified slightly to be slimmer, shorter, and to come to a sharper point. They are for child-elder, male and female sims. They stay on all the time and can be worn with other accessories. Please note: These are just a decoration for the face. Wearing these does not in any way make your sim an actual vampire. Disclaimer: Recolor at will, but do not redistribute the mesh without permission. All recolors should link back to this post. Do not upload to any paysites, and do not upload to the Exchange. I know they're pretty much nonexistant, but feel free to use any color I include with my meshes in your own creations, as long as credit is given and a link to the mesh is provided. HOWEVER, this doesn't apply to anyone else's recolors of my meshes. Those are the property of the respective creators, and you have to ask them about redistribution. All content is by Maxis or me. Prince Irrylath, the Seventh Icarus. Lucy - Gourgeous Female Sim with Sparkling Blue Eyes!